Stephen Wilks was born in England in 1964. He works and lives in Berlin. He stutied at the Beaux-Arts de Paris and at the Royal Academy of arts of Amsterdam. He is a visual artist with multiple dimensions and involvements. He uses many medias : photography, sculpture, drawings and ceramics, and his work is always related to the relationship between the society and the people. This involvement brings him to represent a universal humanity. His project of travelling donkeys perfectly pictures this : the story of hundred of people who made those little animals made of fabric travel (trojandonkey.net). This work about migration and cultures can also be found in his work related to the migrants situation. This brought him to create an impressive installation of 1 400 bottles made of ceramics, that represent stranded bottles, the only thing that remains after a flow of migrants. 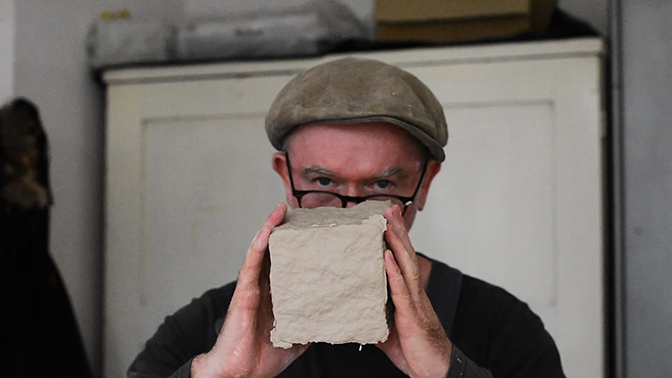 Invited by Apollonia to take part to the project e.city – Berlin, Stephen Wilks has designed a Table – City, an installation made of porcelain bricks that evokes the shape of a metropolis. The artist has thought this object as a place to share. A place for friendliness, sharing and dialog. Because of its symbolic, but also of its shape, it reveals how difficult it is for social and urban spaces to adapt when they face the integration process. This artwork is part of a social and political involvement that has always been fundamental to Stephen Wilks. To create this installation, Apollonia has naturally partnered with the European Institute of Ceramics Arts (IEAC) of Guebwiller. The Table – Ville will be shown in an intermediary version in Guebwiller. at Dominicains de Haute-Alsace, 34 rue des Dominicains, Guebwiller. Exhibition takes place until December 24th 2016. In the frame of Philoxenia, part of e.city – Berlin, Stephen Wilks will present Table-City et Bottle River ceramic pieces evoking the migrant crisis and the western society attitude towards the topics of borders and exclusion. Opening on the 3rd of March 2017 at 6:30 p.m.